11.01.09 Underwater Cam Strikes Again! 07.16.02: How sweet it is! Loftus features two sturdy user built rock pools (top pool reinforced with mortar) with sandy bottoms located along the Middle Fork of the Boise River Road. 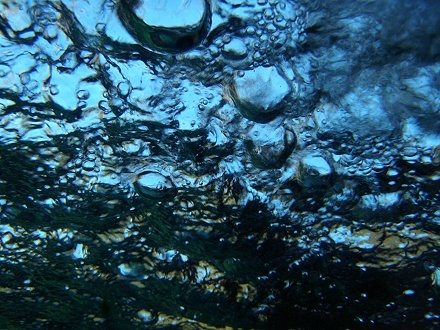 Beware of broken glass in the pool and poison ivy around the pools. Usable all year - note winter access via the only route open (usually) can be very dangerous. Check road conditions with the Forest Service before committing to a winter journey to this area. There are a handful of campsites near the hot spring, not to mention plenty of nearby National Forest campgrounds and primitive sites. Expect wild partiers here - at times I've even encountered multiple kegs with groups of 20+ people. 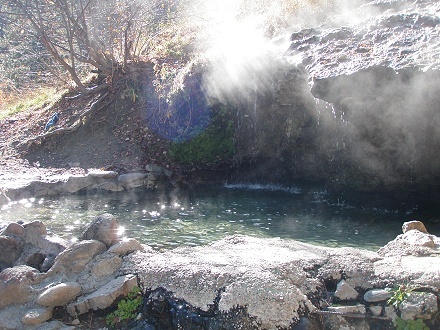 This hot springs has become a favorite party spot for young hunters and ATVers. Restoration efforts derived from local soak seekers have given way to a soakable pool once again at Loftus. However, the current pool is a mere shadow of the former pool's glory. Sadly, the ledge above the upper pool has been mostly broken off no thanks to Jackhole efforts. Unless you've got a high-clearance, 4WD don't bother coming up this road like I did and risk getting killed by crazy people driving at high speed on a road covered in snow, slush and ice - that begins about 5 miles before you hit Loftus. In another month this road more than likely won't be an issue. It was also laced with a ton of ridiculously large pot holes!! The Forest Service should keep the road closed when it gets this bad or maintain it!! Talk about risking motorists lives. At the very least, they could post road condition updates on their website. Finally... at last! A nice long soak was enjoyed at Loftus with minimal interruption. I visited Loftus in conjunction with a number of other hot springs along the Middle Fork of the Boise River. This trip was actually dubbed as the "PIE" trip. I like pie, but not this kind. Poison Ivy Eye (PIE). I partook in a stellar soak, making sure to stick my head (face first) into the hot waterfall that feeds the pool from above. Afterwards, everything seemed fine and dandy. Even hours later, all was well. However, the next morning it was completely swollen shut. Ironically, this was the same day KIVI wanted to chat with me on TV about the demise of the pools at Rocky Canyon Hot Springs. After a little freak out, I finally went to a doc in the box. I thought something was stuck in it. The doc took a look, then asked if I had been in any poison ivy. Well. 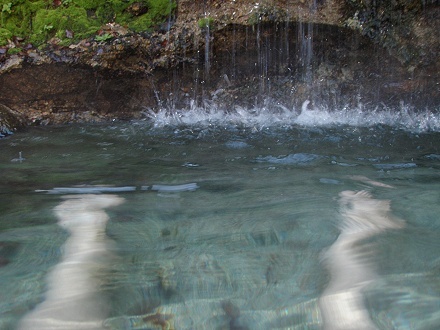 I did notice a few growing above the hot springs, where the hot waterfall originates from. As well as, what I thought to be at the time, small clusters of oil in the actual pool. Apparently, the ivy is too diluted once it enters the pool. However (lucky me), not the case with the waterfall. He prescribed me a $300 tube of steroid cream and was out. My eye eventually opened back up and looked like a beast eye for a few days. KIVI let me keep my shades on by shooting outside, and I have learned to not stick my head into hot waterfalls. Thank goodness the soak was incredible. There was a friendly Asian fellow that soaked as well, but only for about a half hour before leaving. Who, I might add, spent more time than I in the hot waterfall. Nearby, there was a semi-awkward hunter guy who had setup camp at one of the primitive sites. He would wander out of his camp, where he just stood in one place, to a knoll above the road when vehicles passed by. Then, return to his standing position. Luckily he wasn't visible from the pool unless he was milling about. You see/meet all kinds out here folks. I was just happy that there was practically NO TRASH, and that I got enjoy a kick*ss soak without having to pick up a bunch of trash first. Impressive, considering the terrible condition of the entire area my last visit. Side Note: I took the Middle Fork Boise River Road off State HWY 21 near Lucky Peak on the way into the area. On the way out, I made a bad judgment call and took a series of forest roads up towards Morse Creek Summit thinking it would be a quicker way back to Boise. I've taken this route before, but only during the summer. It was a NIGHTMARE. Steep, slick, rutted, wash boarded, frozen and littered with deep pot holes. I had good tires on my truck; a rear-wheel, two-wheel drive vehicle with virtually no weight in the back. It was one of those trips where I kept thinking "Crap. I'm pretty sure I didn't tell anyone where I went." over and over again. Obviously, I made it back, but not after thrashing my truck on the way out. I almost ran over a drunken hunter guy on approach to Loftus. After finally finding a spot amongst the myriad of partiers, I realized that there were at least 2 kegs present. The partiers were a combination of hunters and ATVers from Boise. It was around 10am and most everyone was wasted and there was trash everywhere. You can imagine how shocked I was to find the pool empty. I admit that I was a bit skeptical though, trying not to let my mind wander about what went on in the pool the night before. That thought alone was probably why my soak was short. Or, it could have been the cold looks from the inebriated, so called 'outdoor enthusiasts'. The upper pool at Loftus is in good shape except for a loose rock in the seat part. The lower pool is very small and goobery. Lots of poison ivy in the area too so you have to be careful. Someone built a fire next to the upper pool close enough for burnt wood to get into the pool. We cleaned it but there is still a lot in the pool. 2 of the 3 times we visited there were at least 10 people present. The two steamy pools of Loftus are located right off the washboard road between Boise and Atlanta along the Middle Fork of the Boise River. We visited Loftus on a day when the high temp. was close to 100 (out of the water). The evening felt just as hot due to the overcast conditions and scattered T-storms. The rough road was most definitely the worst part of the whole excursion. The upper pool is in great condition thanks to much volunteer work. Its temperature is a bit on the toasty side though. The lower pool sports a better soaking temperature, but isn't nearly as nice as the pool above. Watch out for poison ivy! Driving by Loftus a total of 4 times on this day (to and fro other HS in the area) revealed that it experienced a continual stream of visitors all day and night. 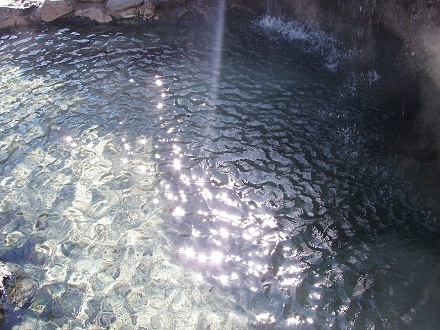 Although, only 1 group was camping at the springs, many people camping in the area or on a drive stopped by for a soak.